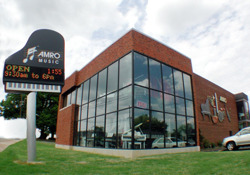 In hopes of serving our customers conveniently, Amro is open six days a week, 61 hours per week, 308 days per year. We are a family business, most of our customers are families, and all of our employees have families. Please give us a call at 901-323-8888 if you have a more specific question about our hours. We believe we can serve our customers best from one large location with an unusually large selection of instruments and accessories and concentrated expertise. During the fall — from late July until September — we have several satellite locations to help with basic band and orchestra rentals and accessories.